At Milestone, we have 3 rooms available to our under 3 year olds with programs that can be specifically designed to meet the age-appropriate stages of your child’s development. All rooms adhere to regulations regarding educator/child ratios and educators in each room remain consistent each day. Each room follows a flexible daily routine and educators ensure that each child’s needs are being fulfilled throughout the day. The children progress through each room at their own pace according to their development and willingness to transition. Educators work closely with families to foster collaborative relationships that will assist children to achieve quality outcomes. We believe that a working partnership between families and educators is beneficial to the ongoing development of each child. Our 6 week-1 year old Nursery room can have up to 10 children per day, and follows a one educator to 4 children ratio. Our nursery is designed to reflect the home environment to allow the babies to feel safe and secure while they are growing and exploring. A separate, tranquil sleep room with soothing music and dimmed lighting helps accommodate each child’s individual sleep routine. The nursery’s daily routine is relaxed and progressive and follows each child’s individual preferences regarding bottles, meals, sleep and play. Our room leader plans for each individual child on a regular basis through a cycle of observation, implementation and evaluation. 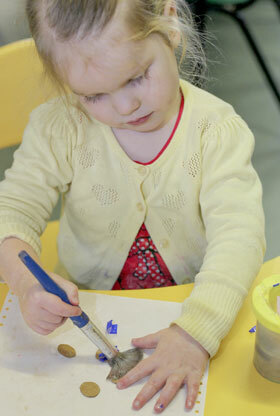 This means that the children are engaging in activities of interest and working on areas of need. 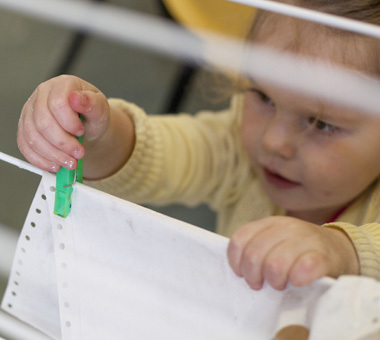 As a nursery child progresses through the nursery room we will support their growth in major areas such as walking, talking and other developmental milestones. Children move up to the Toddler room when they are emotionally and developmentally ready - usually around 14 months of age. Our 1-2 year old Toddler room can have 20 children per day, and follows a one educator to 4 children ratio. The toddler room is a cosy, homely environment that encourages children to become increasingly involved in activities and experiences that fosters a love of learning. The toddler children are involved in a range of age-appropriate experiences such as art, music, movement, and story telling that aide development and encourage children to grow at their own pace. Our room leader provides an educational program that focuses on encouraging independence, and the development of language, self expression and fundamental social skills. The room leader will provide children with resources and activities according to what she has observed, what the children have shown interest in and/or suggestions from families. Our programming is designed to support all areas of learning and development, both indoors and outdoors. When we explore and play in our yards, we are engaging with the environment and actively learning about sustainability. Our 2-3 year old Pre-Kinder room can have 24 children per day, and follows a one educator to 4 children ratio. The pre-kinder room’s flexible routine encourages a range of small and large group activities as well as areas that support co-operative and solitary play. As the children build friendships with their peers, educators will guide them through appropriate social behaviours and skills. Each day, every child will be able to engage with educators in meaningful, open interactions that support the acquisition of skills for life and learning. The pre-kinder room allows adequate space and facilities for your 2 year olds development, including an easy-to-access bathroom for toileting and plenty of areas for indoor physical activity. There is also a lot of focus on children’s self-help skills, as well as constant support for your child’s language and self expression. Our room leader plans, documents and evaluates in accordance with each child’s interests to ensure that children will have ample opportunities to learn problem solving, self help and social skills through experiences. Our programs are equally focused on outdoor play and the children have access to the outdoors at all times for exploring, engaging with and learning in an outdoor space that features both built and natural elements.